Hope all our Jewish readers had a most enjoyable Chanukah. To all our Christians readers, Happy Holidays and best wishes for the new year. Chanukah in Israel is a joyous affair with nightly candle lightings on a large menorah at the Kotel, Western Wall, and many activities for children throughout Israel. Parents often take vacation from work to spend time with their kids, as schools are closed most of Chanukah. Of course, everyone eats suganiot, or filled donuts, which come with many different toppings and fillings. 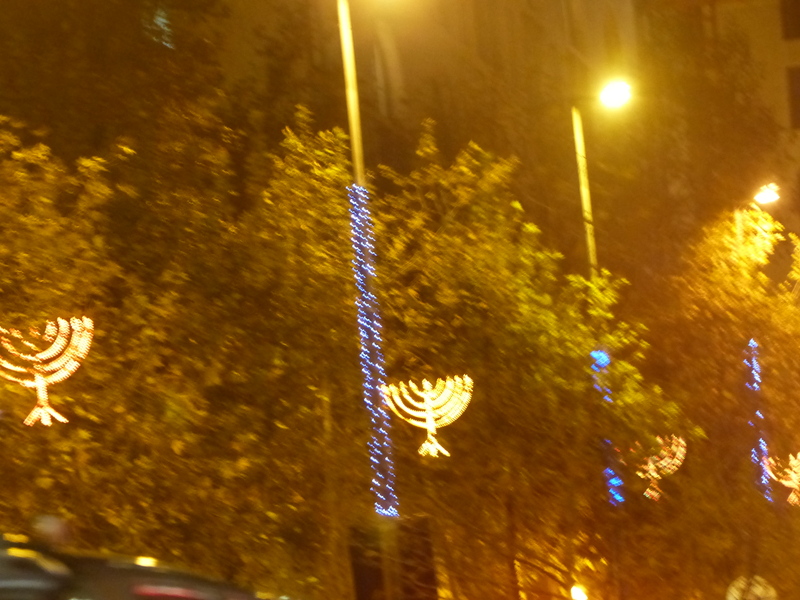 Menorahs adorn many light posts in Jerusalem and other cities in Israel. 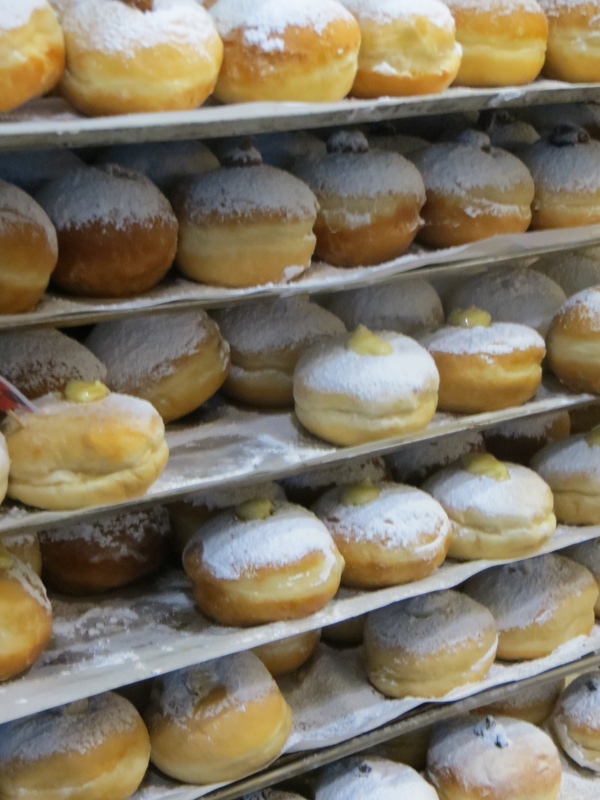 Here are two photos of Chanukah in Israel. Chanukah Menorahs to light the way. In Israel, the Christian Holidays are mainly celebrated in the Christian quarter of the Old City of Jerusalem, Bethlehem (under Palestinian control), Nazareth and in Christian villages and towns. As 2014 draws to a close, it seems fitting to think about the effect the year that just passed had on Jews. In May the ADL released a report which said that a quarter of the world’s population held anti semitic beliefs. As 2014 continued, three Israeli boys were kidnapped and murdered, an Arab boy was murdered in revenge and the Gaza War erupted. Anti Semitic words and images proliferated and were thought to be acceptable in support of Gaza and Hamas in the pro Gaza Anti Israel protests across America and the world. 2014 also saw an increase in anti semitic acts against Jewish college students in the United States, and against Jewish citizens in a number of European countries. ISIS became stronger and some horrific acts of terror took place in Europe and the Middle East, including the attack and murder of men praying in a synagogue in Jerusalem. Russia invaded the Ukraine and annexed Crimea, the Palestinian Israeli peace talks fell apart and the Palestinians tried, but failed, to get the United Nations Security Council to declare Palestine a state with pre 1967 borders. This failure was due mostly to efforts by the United States to defeat the proposal. As a result of the troubles and fears Jews faced around the world, the number of those making Aliyah (immigrating) to Israel rose 32% from last year. Immigrants from France were the largest group and the number of immigrants from the Ukraine increased by 190%. Immigration from North America was up slightly. In summary, anti semitism is rearing its ugly head around the world, causing many Jews to consider moving to Israel. Hatred against the Jewish state is increasing and the Palestinians are increasingly looking to world bodies to help them achieve a Palestinian state and to penalize Israel. For Israel to return to the pre 67 borders is suicidal, as is allowing all those who say they are descendants of those who left Israel in 1947-48 to return. Israel will hold new elections in March and the future direction of the country may well be determined then. As Jews all we can do is hope and pray that 2015 will be a better year for our people, yet be aware of all the dangers that face us. Support for Israel by Americans and by the US government is critical and anything we can do to help shore up that support is vital.